Looking for a graphic & web designer that’ll help you transform your business from blah to BRILLIANT!? Hey, I’m Jen and I’m a small-town graphic & web designer, with big dreams of helping entrepreneurs, bloggers and small business owners kick goals in their businesses through beautiful design, savvy marketing & digital strategies that simply work. So, you’re a rock star entrepreneur or hard-working small business owner but maybe your a little clueless when it comes to the tech stuff like designing an awesome website or putting together a logo & branding that makes you brim with pride? DON’T WORRY, THAT’S WHERE I COME TO THE RESCUE! 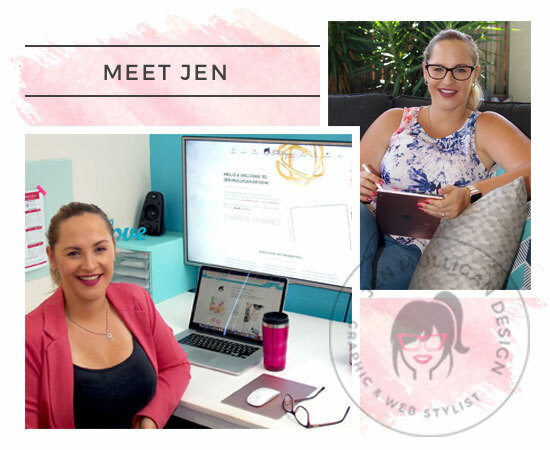 I’m Jen and I’m a brand and web strategist who helps you hard-working heroes to create brands and websites that truly reflect you and your business, showcases your products and talents and attracts your ideal clients & customers like crazy. Since launching Jen Mulligan Design from my little beachside home in Hervey Bay, Australia, I’ve been delighted to have the opportunity to work with a wide range of talented small business owners and entrepreneurs. I’ve created professional brands, logos, print documents & websites for psychics, travel agencies, tour operators, law firms, builders and engineers just to name a few. And when each of them got in touch I found that while they were passionate, confident in their skills & ready to deliver valuable products & services, they just didn’t know where to start when it came to developing a professional brand image & embedding it into a stylish & strategic website or into a beautiful & functional print product. So together, we get our hands dirty to create a brand that reflects you and your business, a website that showcases your talents, products and services or a print product that makes you and your business stand out and shine bright. Not quite ready to work together yet? I’D STILL LOVE TO KEEP IN TOUCH + SEND YOU SOME AWESOME BIZ BUILDING FREEBIES! Pop your name and email address in the form and we’ll keep in touch!